I must admit, I was a little surprised when, a few years back, hyperlocalism came to the East End. For those of us in the media, it’s been a constant buzz word for at least half a decade now, but when I talk to people who aren’t in the business, many are blissfully ignorant of the trend in local news of immediate online updates on breaking stories. From the moment hyperlocalism came to the East End, my email inbox was stuffed with breaking news bulletins with headlines like: Man Pulled Over for Erratic Driving in Greenport. LIPA Agrees to Raise Electric Rates. Zoning Board Approves Lot Line Modification. It was insanity. Every East Hampton Town Board meeting I covered had at least four reporters jockeying for the best seat in the house and for the crucial photo of a vote being cast. I’ve covered congressional committee meetings on the Middle East peace process where I was the only reporter in the room. This all just seemed like the height of silliness to me. One of the best things about living on the East End is the space this place gives you to breathe, to think, to get closer to nature, to get to know your neighbors, to stay close to your family if your family is here, and to prioritize what’s important in life. But once hyperlocalism came to town, it seemed all my days were filled with deleting emails containing nothing but irrelevent information. It didn’t make me feel any closer to the community in which I live. I’ve always bristled at being called a local, even though my family has lived here for generations. Since I was small, there’s always been a tension here between people who live here year-round and second homeowners. I guess some of you call the people who come here “citiots” (that is, city idiots) or some other cute term. The behavior of some people from the city can be downright annoying, I agree. But everybody’s got to be from somewhere, and it’s really just sheer luck that those of us who are from here are from here and not from somewhere else. I went to Venice, Italy last week because I wanted to see what it was like to be a tourist instead of a local, and because I’m just not sure how much longer we’ll have to see Venice before the water rises. I thought I would come back and write a story about how people in Venice don’t like tourists any more than East Enders do. But that’s not what I found there. You see, very few people who are from Venice actually live in Venice anymore. We were staying on Calle del Forno, just a block from the train station, where so many people who own shops in Venice arrive each morning from the mainland and walk to work down a series of main streets that are like the Long Island Expressway, except that everyone is on foot. The commuters begin to arrive at 7 a.m., while the city street sweepers are still walking down the street sweeping away the previous day’s dirt with big straw brooms. An hour later, high school aged students begin pouring down the street, en route to class, laughing as they walk briskly through one of the most beautiful cities in the world. On most days this time of year, there is some flooding at high tide. It seeps out of the canals and onto the sidewalks,where shop owners put down little aluminum platforms so you can walk above the water down the cobblestone streets. At the edge of the canals, there are steps that you can use to get down to the boats. In most places we counted seven sets of steps, all underwater. One set of steps was at the waterline, covered in thick green slime. Most people climbed into the boats directly from the sidewalk. 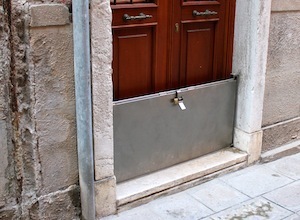 If you still live in Venice, you have very few options to keep the water out of your house: You can abandon your entire first floor and let the water lap in and out, you can stick a slab of marble in your doorsill, or if the water isn’t always quite so high, you can put in a stainless steel floodgate with a rubber gasket seal to protect your home from the high water. We sent pictures of the floodgates to our friends at home whose businesses were flooded during Sandy. In Venice, every house is leaning slightly on the houses next door, so raising your house to escape the flood isn’t really an option. In such a place, it seems, everyone also leans on their neighbors just a little more. We stood on the sidewalk, drinking our morning cappuccino, listening to construction workers debate the fate of the buildings on our block. From what we could gather with our limited comprehension of Italian, quite a few of the buildings would just cost too much to keep them from falling down as the city ages and the bricks and stucco continue to wear down. But when would they crumble? In a place where time is measured in millenia, that might just be an irrelevant question for you and for me. We merged into the crowd of tourists, headed against the traffic moving down to Piazza San Marco, and headed out toward the northern reaches of the city, the quiet streets of sunbathing cats and full clotheslines, through the eerily empty Jewish ghetto to the edge of the sea, overlooking an island graveyard full of cypress trees and the island of Murano. We watched the water lap at the edges of the city, gentle now on a sunny day. Where the island of Venice ends is just another row of houses, just like the rows inside along the edge of the canals, but instead of the waters of the canal lapping at their doorsteps, the waves of the Venetian lagoon were buffeting against the walls of peoples’ homes. 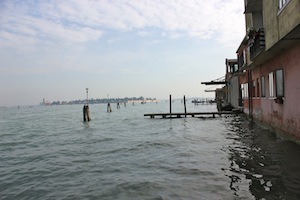 Church bells were ringing, the laundry was drying, and fishing boats were out seining from the open water. We sheepishly ordered from the menu turista, and then apologized to the waitress. “Maybe it is better for us that you are tourists,” she said. We all live on an island, but that island isn’t Long Island and it isn’t the New York Island and it isn’t even the North American Island. Our island is the world. What you consider hyperlocalism, I consider good reporting. It would be great if you could return to having multiple media outlets covering local news so we could get more than 1 perspective (or even one perspective) on local events. Instead we now have media conglomerates who repeat the same version of the same far-away story over and over while ignoring what happens in our backyard. Hi, Ian — it is certainly the case that there has been a news monopoly on the North Fork for too long, and the North Fork is starved for an alternative. That hasn’t really been the case on the South Fork. My point, though, is that it is important for local news to take into account the larger context of the world in which we are living. That gets lost when local news outlets attempt to emulate the example set by media conglomerates, in racing to the bottom in an attempt to get to the flashiest details of a story first. That’s an endemic problem within the industry, regardless of the size of the media outlet.